Posted April 11, 2018 by The Rapid & filed under News. We’re answering your most pressing questions about The Wave! Read more here. Transfers on The Rapid are changing! When you use The Wave, you will no longer need a paper ticket to connect to your other routes. 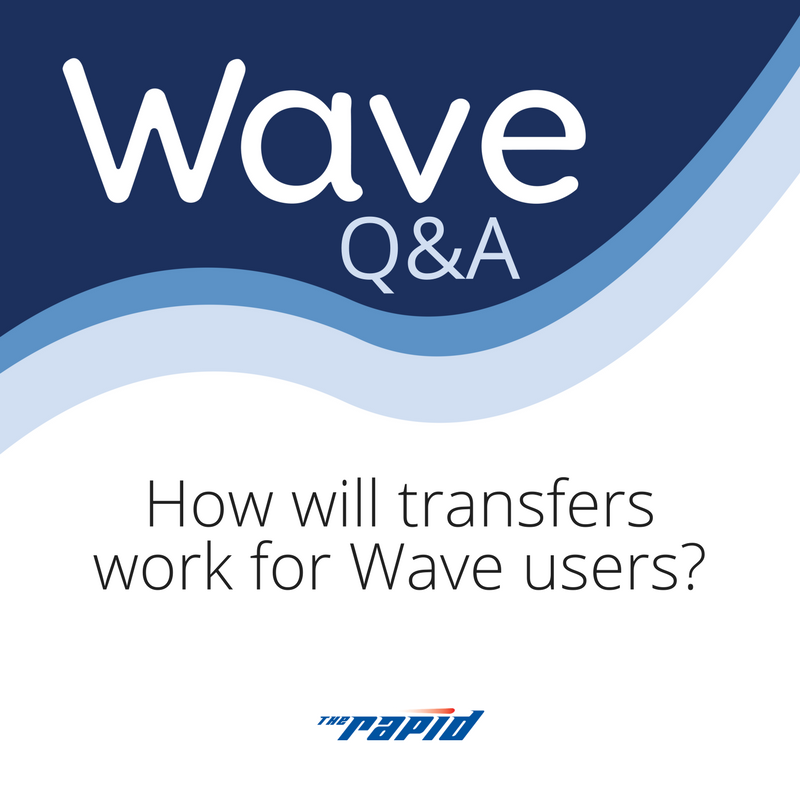 How will transfers work for Wave users? Wave users can say goodbye to paper transfers! With The Wave, you will not need a paper transfer to connect to your other buses. The transfer timeframe is built directly into your Wave card. This means no more waiting for transfers to print or fumbling with them at the farebox. Using your Wave card is simple. Just tap every time you board the bus. With your first tap on, you will have access to a paperless transfer timeframe of 1 hour and 45 minutes (105 minutes). This means that you will have 105 minutes of time to ride wherever you’d like—yes, even on the same route. Think of it as paying once to ride an unlimited amount for 105 minutes. Just check the time on the reader to know when you will be charged for another ride and don’t forget to tap your Wave card every time you board. If you choose to continue to pay cash fare and not use The Wave, eventually paper transfers will be eliminated. This means you will have to pay a single-ride fare each time you board a bus. This is due to the fact that our fareboxes will eventually not produce any kind of paper output. Learn more about The Wave by visiting https://www.ridetherapid.org/the-wave.